Since the beginning of the year there has been a lot of speculation surrounding Apple and the release of a new budget version of their popular iPhone handset. It was suggested at the beginning that the model would arrive later this year alongside the iPhone 5S and we are now seeing new reports that seem to confirm this. This new speculation is suggesting that the new budget iPhone device will begin to be shipped in August, although the handset has not yet been named. It has also been reported by insider sources that the new iPad Mini 2 will also be released at around the same time as this budget model. Production of both of these devices are said to already be underway and their components will be shipped during July ahead of the proposed Autumn release. These new devices are set to be shipped from Apple’s manufacturing partner Pegatron rather than Foxconn which seems to be an unusual move as Foxconn are normally charged with production of new products. Ming-chi Kuo of KGI Securities along with some other analysts have already started to make predictions regarding the number of devices that Apple will ship later this year. Ming-chi Kuo has suggested that a total of 35.8 million iPhone 5S and 53.4 million budget iPhone’s will be shipped before the end of the year. Alongside the new iPhone 5S and the new budget iPhone, Apple are set to launch the new iPad Mini 2. On board this second generation of the miniature tablet device is rumoured to be a new Retina display which will deliver Full HD resolution for the first time. The new budget iPhone will target the mid range of the smartphone market as a more affordable version of the iPhone. We have now seen leaked images of this device which suggest that the model will sport a plastic chassis. This is to ensure that the production costs remain minimal. 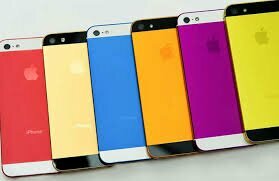 Apple iPhones are known for their large price tag and the company will be hoping that the introduction of this new model will help them to gain a larger share of the mid range market. Apple currently do not have any options is this area of the market apart from older devices which have been reduced in price. Fresh iPhone 5S and budget iPhone deals. Tipped to arrive later in this years third quarter is the new iPhone 5S and it looks as though we will see the new model accompanied by a cheaper version of the iPhone and also a new iPad Mini.